Watchman Monitoring works in conjunction with many traditional package management tools. FileWave has a long history of Mac support, and like our product, offers support for Macs, Windows, and Linux computers as well. FileWave administrators know that keeping their managed computers up to date on the latest model means that all computers have the latest updates and settings. In cases when the local agent can not (or will not) update its model, Watchman Monitoring acts as a security net, warning when if the computer is online, but unable to verify the model. Through our collaboration with FileWave staff, we are able to keep on the lookout for signs of trouble with the FileWave agent, as well as with the computer as a whole. Implementing Watchman Monitoring along with FileWave also means greater interaction with your end users. Our Contact Menu provides a universal destination for links to share resources, urls, file servers, webmail, even the FileWave Kiosk itself. The information below provides a bit more detail, and of course, describes how to create Filesets which allow you to readily deploy Watchman Monitoring to your entire fleet of Macs and PCs. The FileWave plugin for the Mac reports the address of the computer's most recent Model number, its FileWave server, and will generate a warning if the Model isn't checked against its server in 7 days (by default). FileWave's Self-Service Kiosk is a great way to allow end-users to manage their computers, even without admin rights. Watchman Monitoring's Contact Menu helps FileWave Admins put the Kiosk in the Menu Bar (or Task Tray) so that it's just a click away, and easy to refer to on a phone call. 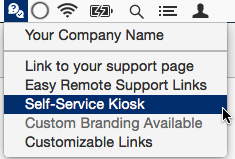 "Look for our icon, Click on "Self-Service Kiosk"
The contents of the Contact Menu are fully customizable in the Watchman Monitoring Dashboard. The names (and icons) can be customized per-subscription or even per-Group. Subscribers can learn more about the Contact Menu in our Community Forum. A flat, signed pkg, which is version-specific, can complete an installation while offline, and is not tied to a specific Group. Group-specific "shill" installers which are preconfigured with a specific Group name, and always install the latest version via a direct download from Watchman Monitoring directly. Because Filesets based on Group-specific "shill" installers do not require updating each time Watchman Monitoring releases a new versoin, they are the preferred deployment method to use with FileWave. Group-independent installation packages are suitable for use when the computers may not have internet access at the time of deployment, or when the FileWave administrator prefers to rollout software updates directly. Click on Filesets in the sidebar. Create either a single Fileset to hold all Group specific installers, or use Client-specific Filesets, according to your current workflow. Click on the Clients in the FileWave Admin sidebar. The FileWave server will ensure Watchman Monitoring is installed as the computers update their model. For deployments where installation will happen offline, or where auto-update is not desired, the following steps will guide you. This is a two part process: first the Group name Fileset, then the full installer. Right-click and rename the Fileset from WM-Group-Mac-TEMPLATE to WM-Group-Mac-[Your FileWave Group Name]. Double click the Fileset, and drill down to /usr/local/etc/wm-preinstall.sh. Click Edit Text. Find and double-click on: ENTER_GROUP_NAME_HERE and enter the desired Watchman Monitoring Group name. Best practice suggests this will be the same as the FileWave Group, although there is no requirement that they match. Spaces, hyphens, and punctuation are ok. Special characters are discouraged. If you wish to manage the rollout of new Watchman Monitoring versions manually, uncomment line 6 to set Update_Enabled false. For best results, ensure this Fileset is deployed ahead of the agent's pkg. We suggest setting the installer pkg's Fileset to the lowest priority. Download the signed installer pkg. Drag the .pkg to the Fileset pane of the FileWave Admin tool to create a package set. Rename the Fileset to include the current version number. Use Properties to set the Priority to lowest, ensuring the Group name Fileset runs first. Subscribers with access to our Windows beta can download an .msi installer from their dashboard. The steps here are largely the same as the Mac OS, with labels changed to reflect the platform. Detailed instructions for Fileset creation will be posted as we refine our Group-specific windows installers. This is a two Fileset process. The first sets the Group, the next runs the traditional .msi installer. Right-click and rename the Fileset from WM-Group-Win-TEMPLATE to WM-Group-Win-[Your FileWave Group Name]. Find and double-click on: ENTER_GROUP_NAME_HERE on lines 17 and 20, and enter the desired Watchman Monitoring Group name. Drag the .msi to the Fileset pane of the FileWave Admin tool to create a package set. 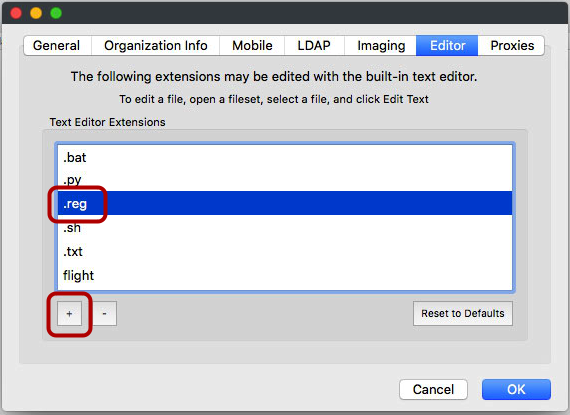 Enable direct editing of the .reg file by adding .reg to the list of allowed Editor Extensions in the FileWave Admin preferences.